Sometimes, estimates do create trust. They provide a comfortable feeling to many people that you have an idea of what size this beast is. That's why I offer solutions for a gross estimate in Predicting the Unpredictable. I have nothing against gross estimates. I don't like gross estimates (or even detailed estimates) as a way to evaluate projects in the project portfolio because estimates are guesses. Estimates are not a great way to understand and discuss the value of a project. They might be one piece of the valuation discussion, but if you use them as the only way to value a project, you are missing the value discussion you need to have. See Why Cost is the Wrong Question for Evaluating Projects in Your Project Portfolio. I have not found that only estimates create trust. I have found that delivering the product (or interim product) creates more trust. Way back, when I was a software developer, I had a difficult machine vision project. Back then, we invented as we went. We had some in-house libraries, but we had to develop new solutions for each customer. I had an estimate of 8 weeks for that project. I prototyped and tried a gazillion things. Finally, at 6 weeks, I had a working prototype. I showed it to my managers and other interested people. I finished the project and we shipped it. By that time, I had managed people like me. I asked them for visual updates on their status each week or two. I had learned from my experiences. They trusted my initial estimate. It's a good thing they didn't ask for updated estimates each week. I remember that project as a series of highs and lows. That's the problem with invention/innovation. You can keep track of your progress. You can determine ways to make progress. And, with the highs, your meet or beat your estimate. With the lows, you extend your estimate. I remember that at the beginning of week 5 I was sure I was not going to meet my date. Then, I discovered a way to make the project work. I remember my surprise that it was something “that easy.” It wasn't easy. I had tracked my experiments in my notebook. There wasn't much more I could do. Since then, I asked my managers, “When do you want to know my project is in trouble? As soon as it I think I'm not going to meet my date; after I do some experiments; or the last possible moment?” I create trust when I ask that question because it shows I'm taking their concerns seriously. Created a first draft estimate. Tracked my work so I could show visible progress and what didn't work. Delivered often. That is why I like inch-pebbles. Yes, after that project, I often had one- or two-day deliverables. Estimates can be useful. They can show you the risks. And, I'm sure that only having estimates is insufficient for building trust. 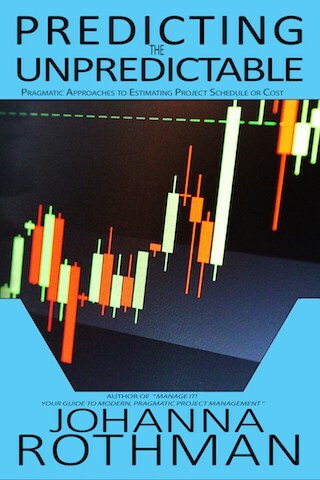 If you want to learn more about estimation, see Predicting the Unpredictable: Pragmatic Approaches to Estimating Cost or Schedule.